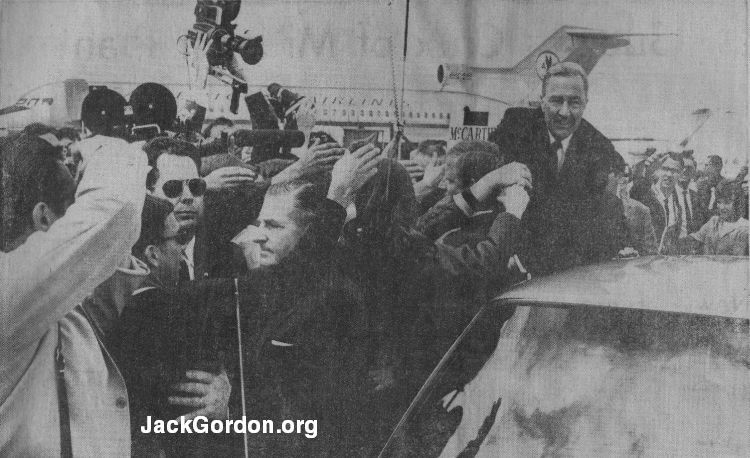 Mel Anderson, long-time Seattle entrepreneur and pro­motion director for KVI radio, today joins Jack Gordon, long-time general greeter for Greater Seattle, in covering the visit of Democratic presidential hopeful Senator Eugene McCarthy. Previously Gordon wrote his impressions of wel­come ceremonies for GOP hopefuls Richard Nixon and Gov­ernor Rockefeller as well as the late Senator Robert F. Kennedy, a Democratic contender. He runs a super-cool show, the Man comes in, does his thing, and splits; he's outdrawn all the other presidential candidates who have visited the Northwest this season and his airport supporters were the most polite political activists we've ever encountered! The American Cancer Society would have been proud of the McCarthy supporters. None of them was smoking. Neither does the senator. This was in sharp contrast to the smoke-filled press pen that caused Airport public relations man Ed Simonds to fret about false fire alarms. THERE WERE "FLOWER" folks on hand among the young people, and many adults, but very few of the hippie-type which the senator's detractors predicted would come out. The signs — one was still wet — ranged from peace symbols on the "Go, Gene, Go" and "Dump the Hump' placards to "Eric for Top Dog," which is the McCarthy camp's very polite suggestion that the senator's dog "Eric" is ready, willing and able to take over the White (Dog) House presently occupied by the beagle "Yuki" and friends. Congressman Brock Adams drew the first big hand as the press and dignitaries emerged from the plane. --P-I Photo by Gary Tolman. Before the plane's arrival the assembly of people was the most orderly we've ever seen at a political drama of this type. Their only violation of the decorum of the day was to stream across the Sea-Tac runways because the arrival area was located about a half-mile south of the passenger terminal. The Secret Service, state police, King County sher­iff's deputies and Chief Barker's airport police were polite and had very little trouble but they kept the crowd control lines up. This made life in the press pen livable and everybody got a chance to see The Man. THERE WERE NO INCIDENTS of any kind and even the two boys who carried the "Nixon" sign were on their best behavior. Major league baseball scouts must not be doing their jobs well or they'd have signed McCarthy before he got into this pennant race. The slender six-foot-two senator stepped from the aircraft with a more graceful and ath­letic gait than you'll find in any major league outfield. McCarthy has an aide, Mike Campbell, who also doubles as traveling, athletic director. Campbell is easy to spot because the senator's Louisville Slugger Jackie Robinson "autograph model" sticks out from his luggage. Campbell's bag also includes a baseball glove, ball and football. We were left with the impression that the sen­ator's wide stance at bat has been developed because his press aides have told him this will make the picture wider in the newspaper. The senator was being directed up the steps to the speaker's platform when he thoughtfully left the steps to go over to personally thank the musicians. --P-I Photo by Dave Potts. REALIZING IT'S DIFFICULT for a bass player in action to shake hands, McCarthy touched musician Tammy Burdett gently on the arm and said: "Thank you for bringing out the music." Thanking Miss Burdett, Boscacci and clarinetist Glenn Martin and drummer Chuck Mahaffy was McCarthy's own thing; it was not done for photographers, he seemed to do it because he thought it was the ting [sic] to do. Senator McCarthy seems to be a very mannerly man. 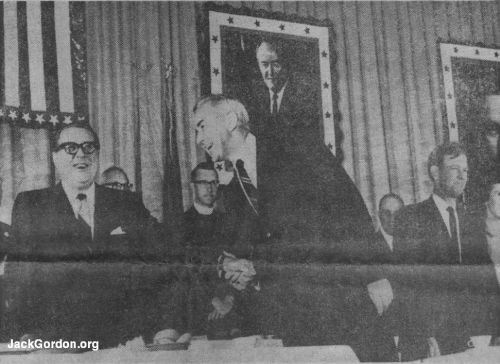 The press had planned to compare the crowd reac­tion on the senators's arrival with the welcome for Vice President Hubert H. Humphrey . . . but the "veep" passed up the fun and games at the Democratic State Convention because of an attack of influenza. So, now nobody will know for sure until the National Convention in Chicago in August just how their crowd "Hooper" rat­ings are developing. There was greater press interest in this visit than any we can remember dating back to 1948 when president Harry S. Truman was accorded a tremendous greeting in downtown Seattle streets. There were almost 200 Western press accredited from California to Alaska and seme 30 national press in the gallery for this one. 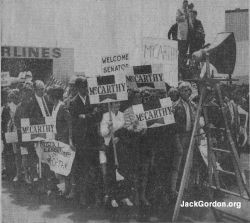 The "advance men" for Senator McCarthy, Sheridan Bailey and Bob Sonderskov, put together a jim-dandy of a welcome ... there was one of the better press working areas we've seen, an improvised platform high enough for all to see and a rented sound system that squeaked only once. Only problem was that chief greeter Paul Pedersen was lost in a sea of cameras as McCarthy arrived. THE ADVANCE PROMOTION was one of the best done in this area for a political visit. There were paid newspaper advertisements, radio and TV spots, leaflets, a telephone campaign to the "faithful" and plenty of word-of-mouth. They probably spent a few "grand" to put it together but they were gambling for high stakes ... 64 National Convention delegates. The spirit of the late Adlai Stevenson seemed to linger over the goings-on since many McCarthy supporters see Stevenson's ideals in McCarthy's program and policies. 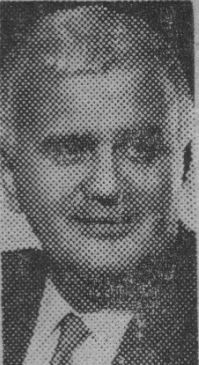 The only complicating factor was the announce­ment that Adlai Stevenson III, the late governor's son, was coming out to Tacoma to speak at the convention on behalf of the senator's No. 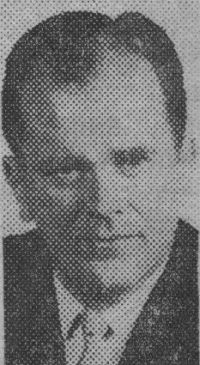 1 rival, Vice President Hum­phrey. There's been more secrecy in the planning for this welcome than any we've observed before and it wasn't the fault of the Secret Service or the other security officials. It was just that this spirit of rivalry ... it appears to be stronger than the Notre Dame-Army football game rivalry ... permeated most discussions. Interwoven with all this was the real scrap between, the rival camps ... the "old politics" vs. the "new politics" and some of the intense competition was obvious during the advance planning until the Triple-H men silently folded their tents and blew town when Mr. Humphrey canceled. The "old politics" put the emphasis on class but yesterday's sample of the "new politics," where the accent is on style, may shove the "Last Hurrah!" farther back on the library shelves.